We are tidying up the production area and the tasting room, getting ready to greet our opening weekend visitors! 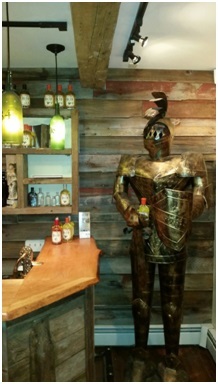 We have said hello to many this week who saw Sir Meadalot guarding our door and popped their heads in to say "Hi." We are hoping for good weather so we can spread out our special guests. If someone has an in with the weather forecaster, give them a call, will ya? Maggie Collins, Bee Educator, Essex County Beekeepers Association: discusses how to care for a bee hive - suits, smokers, and microscopes! The Mazer will be on hand all day to answer your questions about mead making! Marshview Apiary, another of our local honey supplier, on hand to discuss what it takes to be an apiarist, also selling local Ipswich honey and bee wax goods. Music by the Knotty Celtics, folk duo! We have built it. Will you come? April is here!! The snow has melted enough to reveal peeks of grass turning green in the warm sun and we can see daffodils and tulips poking up as a wonderful sign of spring. Spring is renewal - a new beginning. 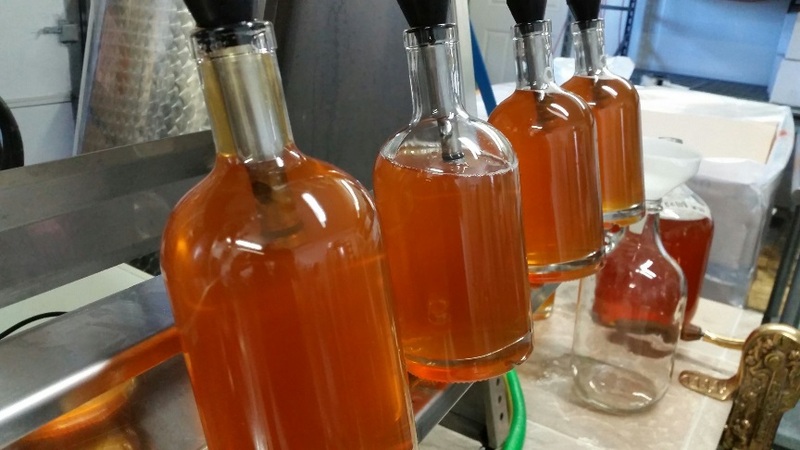 A new small business - an exciting start for those of us at the core of the 1634 Meadery. In many ways it seems like forever since we sat in Dan's idling truck gazing at the rental property at 3 Short Street that would become the 1634 Meadery. So much time was spent WAITING for licensing, label approval, formula okays from the government and more. And now, barely 2 weeks until opening weekend (April 24 - 26th!!! ), it now seems like a whirlwind, a fast and exhilarating roller coaster ride. 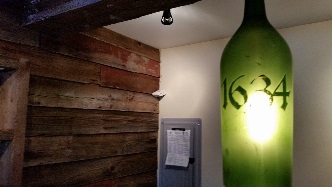 The tasting room work was fast and furious but the result, we think, is warm and inviting - it is something you must see. The bottling went very smoothly and we have conquered the label machine once and for all (forgive us if your label is slightly off center... it kind of reflects our personalities!). We are polishing the place up and will be ready for our first guests Friday, April 24 at 2 pm! Come by and learn about bees, honey, fermentation, mead, mead history and our production. Then, stay for a tasting! Here is the tentative schedule of events for our opening weekend! 1:30 Tours and Tastings begin! All day! TBA: Meet the Apiarist! Q & A with one of our honey suppliers and buy some local honey! 12 pm Tours and Tastings! All day! TBA: Meet the Marshview Apiaries beekeeper! Q & A with one of our honey suppliers from Ipswich! So, back a year ago, when we actually decided to DO THIS THING and start a small scale commercial meadery, we had no idea how this was about to change our lives. But as we roll nearer to our 50 days to opening countdown, we reflect on how far we have come (and how far we need to go!). Our desire to share our passion for mead has demanded that we become "Jacks of all Trades" and learn so many new things! Opening a small business is a crazy choice, and now, looking back, I think for choice for slightly crazy people! SO much to know and learn and do. Especially in the alcohol realm, state and federal guidelines take 28 hours a day, a gallon of sweat and 3 pints of blood to understand and follow to complete and submit paperwork correctly (and, mark our words, either you or they will have missed something - despite your greatest efforts, and time will be added to the turn-around....). I tip my hat to anyone who has had the brim and vigor and guts to follow a dream and do what they LOVE. And even more kudos if the business is still standing after a year! SO, can we give you a glimpse of what this all means? I will try! Mead Man Dan has become the meadery's full time CEO, CFO, COO, lead tasting room reconstruction manager, head fermentation chemist, taste tester, director of day to day operations, accountant and comptroller, a dang good graphic artist, editor, facilities manager, quality control boss, web site designer and manager... And he remains a really awesome dad to our wonderful girls. Besides still holding full time jobs as mom and high school science teacher, I have become lead label writer, editor, public relations manager, head marketing agent, and design staff, director of networking, social media administrator, and interior design is now on the resume. I assist with day to day operations, am lead custodian and food shuttler (yah gotta eat sometime!)! What does all this mean? It means we sure wish we had 30 hours in a day to get everything done. It means we arise at 4:00 am because we cannot sleep. We sleepily wander downstairs to make coffee and write the blog that caused us to not sleep in the first place. Or review the "to do" list that seems to keep growing despite our best efforts to get stuff done. But, neither one of us would trade it for the world. Dan is so happy, the happiest I have seen him in a long time, because he is doing what he LOVES. He works for his passion. And how many of us can say that? And it makes me smile.